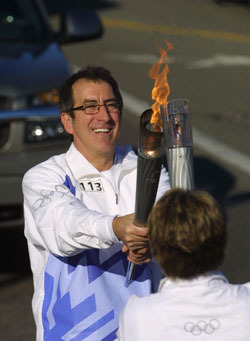 ...On Telegraph Avenue, Hollywood director and choreographer Kenny Ortega was also swept up in the Olympic spirit. The Redwood City native said carrying the torch was an "amazing honor," one that he didn't want to miss even though he is producing and directing the opening and closing ceremonies of the Salt Lake City Olympics...Ortega said he felt only a sense of great pride as he ran his route from 43rd to 40th streets. "I saw smiling faces," he said of the people on the sidewalk. "That was a pretty great moment."